I haven't done much today. We laid in bed a long time watching the snow and drinking coffee. When I finally got up, I did my household tasks (you know...garbage, recycling, dishes) and then I went back to bed to read. 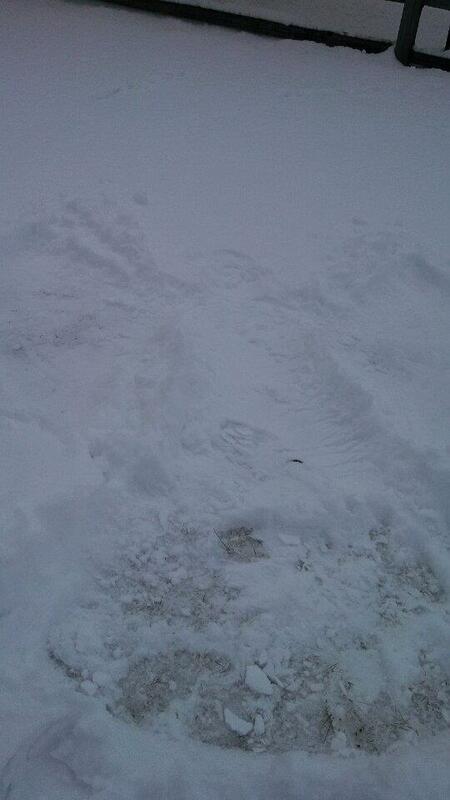 When I got up from that siesta, I went outside to shovel the walk while Regis used the snow blower on the driveway. 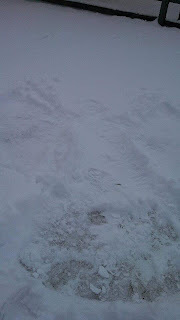 It didn't take long so I made three snow angels and took pictures of them. It was so warm that I laid in the snow for a while and watched the clouds roll by. The sun felt good on my face and I realized how much I enjoy doing nothing. I sat on the steps for a while until Regis finished, then went back in to read. I've done some knitting, read some more, posted a couple things on the social media, and brought in the mail which was a waste of time. Tomorrow, I am planning to walk downtown to do a few things. I made it sound like the joy of doing nothing was some kind of revelation. It wasn't. I have always had the nature that appreciates non-productivity. Given the choice of accomplishing a lot or nothing, I will almost always choose nothing. There are cultures where this is thought of a gift. Too bad I don't happen to live in one of them. I hope I used the right tense of lay. I get confused about that but I do not mean we were laying eggs in bed or that I was laying eggs in the snow. I figure most of you are quite literate and will figure it out. I don't feel like looking it up right now as I'm busy. Regis and I went to a new restaurant yesterday with bonfire in the title. The food was not good. We had a pizza that was so heavily spiced it was almost inedible. The steak bites were tough and the wine was very costly. We won't be cruising back there any time soon. They had us packed in like sardines, too. I could have reached over and grabbed something off the next table but their food didn't look good enough to risk it. We didn't even go exercise today. We called in with the general malaise. Everybody gets a day like this once in a while and this happened to be ours. We'll do better tomorrow. My goal is for supreme slothfulness! I see nothing wrong with it! Our experience at the restaurant with "bonfire" in it was similar to yours, except there were just the two of us and we were in a booth, so no sardines. My food was okay, but barely warm. Larry said his food was good, but not more than that. Too expensive for sure. I would expect pizza to be really good there. Too bad it wasn't. I hope your poor review and mine will change after they are around a bit longer. I really had hoped the so-so food was do to the newness of the place, staff, etc. Oh cripes, "due to", not "do to". Help! Hey, I'm not the grammar police!